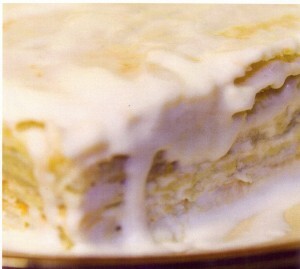 Napoleon Cake in my Cookbook “A Firebird Cornucopia of Russian Delights”, 310 recipes of former Soviet Republics which always maintained their national and favorite dishes.These recipes became a part of everyday Russian Soviet life. Today I have looked at Napoleon cakes recipes on the Internet and found a great number of them in Japan, China, France, England and in many other countries. It seems to me that everybody likes Napoleon. Even some discuss the origin of the name of this cake. All jokes aside! Why is it so? 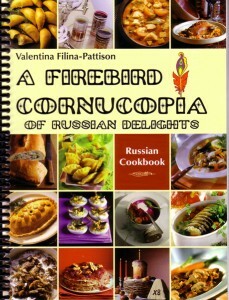 And what is special in my cookbook among hundreds being sold at the bookstores and in the grocery shops? Simple recipes first because my mama and my grandma as well as myself were always in short of time to cook but our family members were waiting for a nice healthy food at the dinner table.Second of all, do you remember I mentioned before it is a beauty – a souvenir book, filled with nostalgic memories and this is why it is a conversational piece and a creative guide to the true meaning of the Russian everyday cooking. From ancient to the present time food among Russian people has always been more than a commodity; it is a way in which folks celebrate the feast of life and the passing into death. Food is sacred in Orthodoxy, it is blessed before eating, nourishing both the physical and spiritual. God bless you and your endeavors to create so many beautiful Russian delights.On page 142 one can see the recipe of cake Napoleon. My life story book “To the Horizon and Beyond”, 277 pages, 8 ill.,Trafford Publ.,2003, ISBN1-4120-0036-X, National Library of Canada Cataloguing in Publication.